Buy Friendly Soap Shampoo Bar - Lavender & Tea Tree in the UK from our online shop or directly from our independent Scottish store. This nourishing Shampoo Bar is made with Castor Oil to create a deeply conditioning, creamy lather that cleans and cares for your locks and scalp. The essential oils of lavender and tea tree are favoured for their antibacterial qualities and promoting healthy hair growth No plastic packaging! Castor oil has been used for centuries as a natural hair conditioner and scalp treatment. We combine this with coconut oil and olive oil to produce a rich, moisturising shampoo. The essential oils of lavender and tea tree are favoured for their antibacterial qualities and promoting healthy hair growth. A long-lasting and compact alternative to plastic bottles of liquid shampoo, one Friendly shampoo bar will last as long as three bottles of liquid shampoo. And it loves to travel. Each bar is handmade with Castor Oil, Coconut Oil, Olive Oil, Lavender and Tea Tree essential oils, water. And nothing else. We sell real Friendly Soap and other Shampoos directly from our shop in Scotland and online throughout the UK. View more products from Friendly Soap. Where can you buy real Shampoo Bar Lavender & Tea Tree safely online? 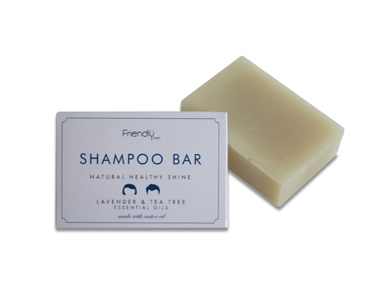 If you are wondering where you can buy Friendly Soap Shampoo Bar - Lavender & Tea Tree safely online in the UK, then shop with us. We are an actual health foods shop; with real people selling real foods and products. Our award-winning independent shop is located in Stirling, Scotland since 1976. You can buy our Shampoos in store or safely place an order with us online or over the phone. Shampoo Bar Lavender & Tea Tree - Friendly Soap Shampoo Bar - Lavender & Tea Tree in Shampoos and Hair Care.